PHUKET: Nine died and seven were injured after two pickup trucks – one carrying wedding guests returning to Trang from Phuket and one ferrying road construction workers – collided in Krabi last night. Police were called to the scene at the dangerous curve known as harm tai (“forbidden to die”) in Sai Khao district at 8pm. There they found two wrecked pickups, a Toyota and an Isuzu. Six passengers were dead at the scene and 10 were injured. 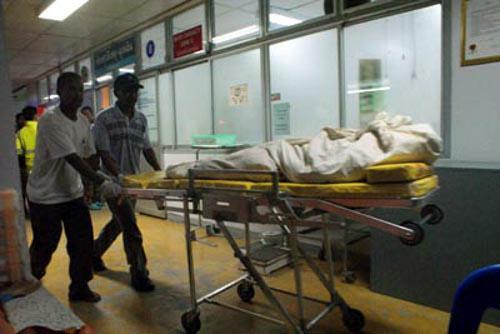 The injured were taken to an area hospital, where three more later succumbed to their injuries. “The construction workers were headed back to their camp in Klong Thom District and the wedding guests were coming from Phuket, headed to Trang,” said Lt Wirat Madosod of the Sai Khao Police. “It appears that the driver of the construction-workers’ truck lost control in the rain and slammed into the wedding-guests’ truck on the curve,” he said. Police have only identified three of the nine who died in the crash: Haroon Komkum, 22, from Narathiwat; Gudee Dudobe, 20, from Narathiwat; and Wandee Jeemung, 61, from Trang. Police believe road conditions were the cause of the accident. However, they are continuing their investigation.